Indira Gandhi National Open University, the largest open university in the world (IGNOU) offers MBA courses to management education aspirants from all over India and eligible foriegn students. Read on to find out more about MBA programmes offered by IGNOU. Are you looking for information about IGNOU’s Distance MBA Program? Get the complete overview of the program by reading this article. Are you eligible for the MBA offered by IGNOU? Find out more here. Never miss a deadline to submit your application. Find all the important dates here. Download the official MBA prospectus for 2019 published by IGNOU. Whether you are a fresher who just finished out of college or a business executive or an entrepreneur, IGNOU MBA is a very good solution for you to pursue your dreams in management education. IGNOU offers a variety of MBA programs tailored to meet the requirements of people of various backgrounds. Read more about the different MBA programs offered by IGNOU in the sections below. IGNOU primarily offers its MBA program through the Open Distance Learning Mode (ODL) also known as correspondence learning. It is one of the most sought after version of the MBA programs offered by IGNOU. Executive MBA programs are specifically designed to meet the requirements of the working executives who wish to up-skill and move forward in their careers. These MBA programs are mostly opted by mid-career executives. For those who want to specialize their MBA, there is an option for that too. The specialization MBA programs offered by IGNOU caters to people from various fields like Banking, Information Technology etc. to obtain an MBA relevant to their fields of action. Check out this section for more MBA programs. IGNOU is undoubtedly the number one distance education university. The MBA program offered by IGNOU is of exceptional quality. MBA and many other programs offered by IGNOU are approved by UGC, making them valid across India. The MBA from IGNOU is approved by AICTE, which regulates the technical education programs in India. IGNOU’s fees are very low compared to other distance education universities in the government and private sector. The MBA programs offered by IGNOU are highly flexible to meet the requirements of all busy people from all walks of life. However, the following people find it highly useful as an option for MBA. These are the people who innovate with their ideas. They use their entrepreneurial skills to build up their businesses. 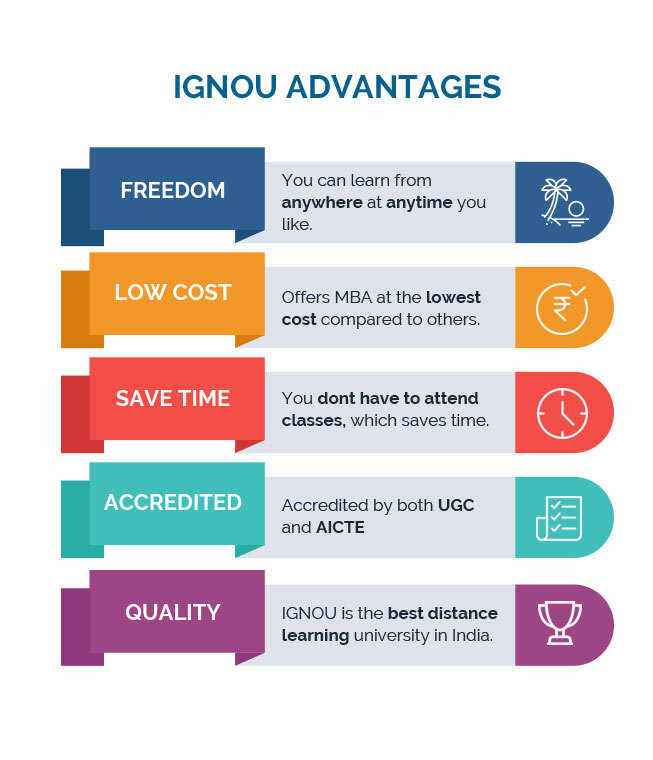 If you are an entrepreneur your busy life might prevent you from getting an MBA from a brick and mortar institution, this is where IGNOU comes to your rescue by providing you with their flexible MBA programs. In the hunt for a job? Don’t have the time or finances for a regular MBA? This is your opportunity to get your dreams fulfilled. Always wanted that promotion you dreamed of ? or want to ask for a raise in salary? and you are being barred from all these just because you don’t have the educational qualification? IGNOU MBA is at your rescue. You can get an MBA without risking your current job by pursuing your course as part time or distance method. Here are some frequently asked questions about IGNOU’s MBA program. If you did not find the answer to your question, then you can contact us to get more details. Is IGNOU MBA program recognized by UGC? Yes, the MBA program offered by IGNOU is recognized by the University Grants Commission (UGC). Is the MBA program recognized by AICTE? Yes the MBA program offered by IGNOU is recognized by AICTE. Is the MBA accepted worldwide? IGNOU is a reputed university worldwide. But the acceptence of IGNOU’s programs vary from country to country and employer to employer. Will it help me to get a job? IGNOU’s MBA is a certification that you have successfully completed the courses prescribed by IGNOU. You will need skills relevant to your field of work to be successfully placed in a company. Is IGNOU MBA valid for government jobs? Yes, most government agencies and public sector companies accept IGNOU’s MBA program. Can I work while I am doing my MBA from IGNOU? 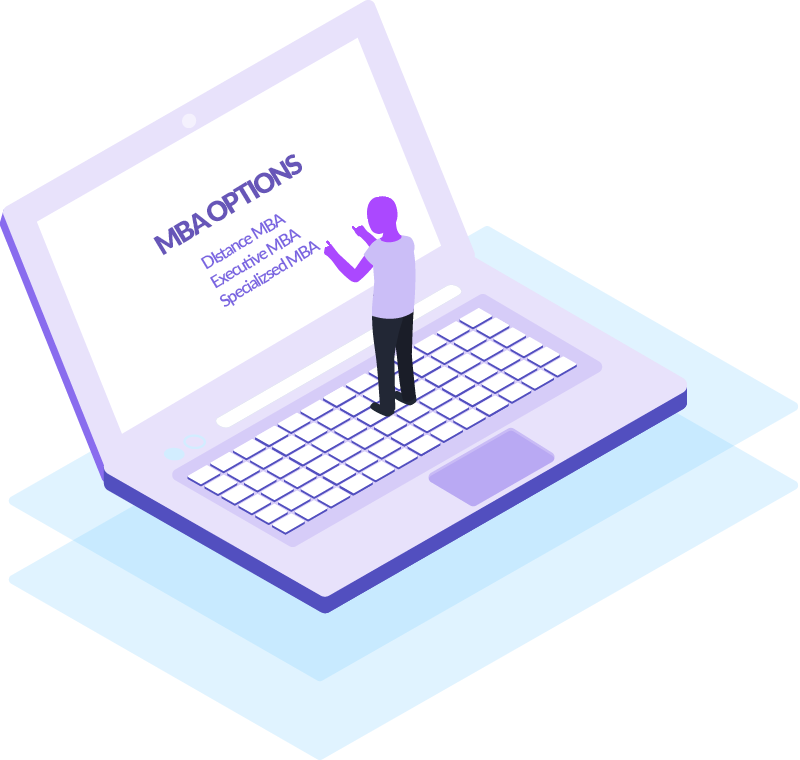 Yes, the MBA program is offered in the distance learning mode so you can continue with your current work while you learn.